Record Exchange 5320 Hampton Ave.
E. Nor. Mous. This cavernous space in South City was formerly a branch of the public library. 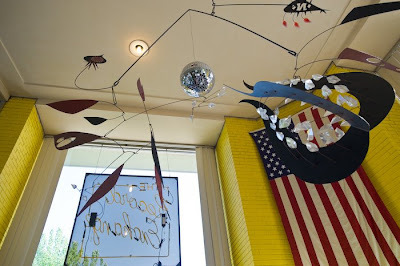 The presence of the original Calder mobile in the entryway is almost drowned out by the cliffs of used VHS cassettes and 6 foot wide 45 cutouts hanging on the walls. 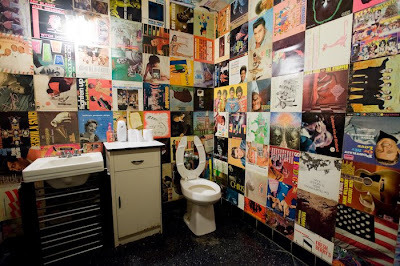 Depending on where you wander, you will encounter not just records but stacks of old amplifiers and tape decks, reel-to-reel machines, 78’s, boxes of yet unsorted LP’s, shrink wrapped music magazines featuring Elvis, concert posters, guitars, drum sets, Califone turntables with Airforce bomber-grade earphones. Most days you will see the calm eye in the center of the storm, Gene (or Jean? 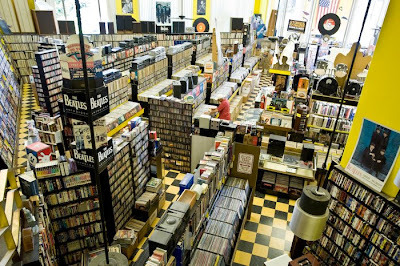 ), who somehow manages to sort, organize and price the records in this 10,000 sq. foot store. 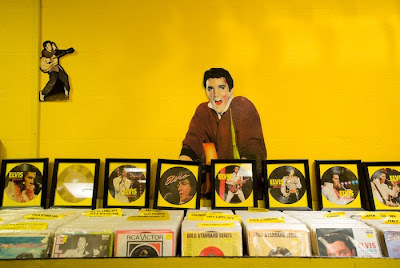 For the 45 junkies, there is a separate room upstairs with over 10,000 singles laid out in rows, separated into various categories: pic sleeves, colored vinyl, soul, rock n’ roll, 80's, Elvis, Beatles, etc. The upstairs also has a section of collectible LPs, skewed predominantly towards 50’s and 60’s ‘oldies but goodies’. 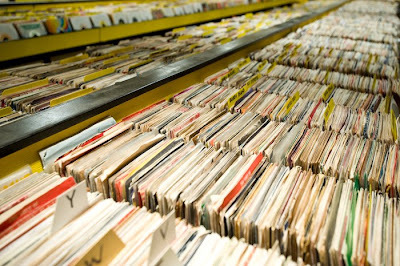 Hunting Strategy: First you must submit to the reality that you will never know or acquire every record in the universe (or even just the good ones). Like the Louvre, you won't be able to see it all in one day. Focus on a genre and flip through large swaths until the interesting things pop up. When you find yourself getting tired and cranky, its time to whittle down the pile and go home. Strengths: The proletariat source for any recording on any medium. Several record players around the store for listening. The 45 room is unlike anything I've seen before - possibly a treasure trove for 7" specialists. Relaxed, friendly and low-key place, if you bring a hefty stack up to the counter they will often cut a discount off the top (without having to ask) and anyway, the prices are very reasonable to begin with. Weaknesses: The system of classification here runs on a more antiquated line of collector’s aesthetics i.e. 50's centric, kinda white, goldmine guide etc. But to me, the un-hipness adds to the appeal of coming here. In Summary: The record shop at the end of Dylan’s Highway 61. Bring a snack. PS - a great place to poop!